How Many Calories Will 200 Situps Burn? Situps are a simple exercise to add to any workout regimen. This exercise strengthens your core and plays a role in your overall fitness, but it isn't a quick way to burn calories. Unlike cardio exercises, strength-training exercises burn calories slowly and their chief purpose is to strengthen your muscles. Even if you're able to perform 200 situps, the calorie burn will be lower than other activities. Most people aren't able to perform 200 consecutive situps. If your workout goal includes performing 200 situps, it's reasonable to attempt them in 10 sets of 20 reps. The rate at which you burn calories during this exercise depends on your pace. If you average a moderate pace of three seconds per rep, you can perform 20 situps in 60 seconds. At this rate, you'd complete 200 situps in 10 minutes. HealthStatus notes a 140-pound person burns 47 calories during 10 minutes of moderate-intensity situps. If you're not familiar with the rate at which various exercises burn calories, it's easy to think 47 calories in 10 minutes is an efficient calorie burn. This rate, however, is extremely low. Cardio exercises, which are instrumental in weight loss and the maintenance of a healthy body, burn calories much faster. In 10 minutes of running at 6 mph, for example, a 140-pound person burns 106 calories. Whereas it's difficult to perform situps for a considerable length, it's easier to run for 30 or even 60 minutes. Despite the low calorie burn of situps, this exercise has several benefits. It targets your abs but also strengthens your obliques, hip flexors and a number of muscles in your legs. Strength-training exercises can improve your strength, balance and flexibility, and lead to lower blood pressure. Dedication to exercises such as situps can also elevate your metabolism, making this exercise a valuable addition to any weight-loss workout. Being able to perform 200 situps isn't necessarily a sign you're physically fit. It could actually be proof you're performing the exercise incorrectly, which can lead to muscle or joint injuries. 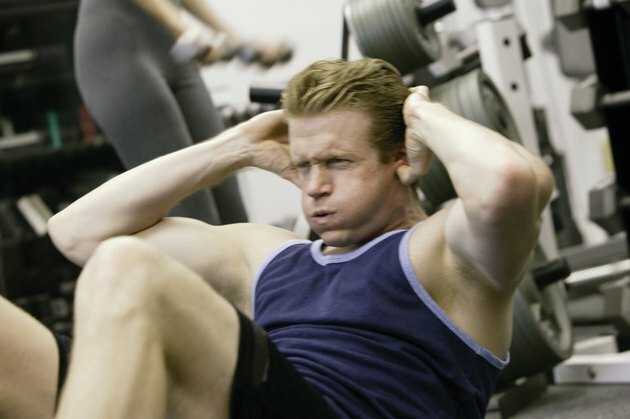 The American Council on Exercise cautions against high-rep ab exercises, noting that if you're able to comfortably perform more than 25 consecutive reps, the probability is high that you're performing the exercise incorrectly. Instead of aiming for 200-rep workouts, set your sights on three sets of no more than 25 reps.